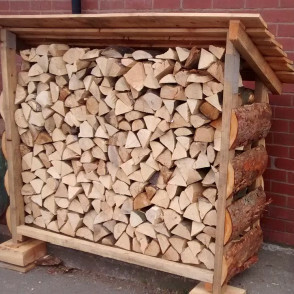 Hand-made Log Store, from local virgin woods sourced from the Greater Manchester area. Beautifully designed and crafted at our site in Gorton. A perfect way to safely store your firewood (not included). Various sizes available (more info below), and can be made in custom sizes, contact us to discuss. Log sheds do not come stocked with firewood. PLEASE NOTE: A delivery charge applies, see details below. This handmade Log Shed is a great, rustic way of storing your firewood to keep it better protected from the elements, as well as making your firewood easily accessible when you need it! It not only looks fab, with the lovely waney-edges, but it’s a really practical way to keep your firewood in order and get it seasoned for winter. All the timber used to make these log stores is milled from virgin wood, sourced locally and sustainably from the Greater Manchester area and we design and create these stores at our Yard in Gorton. Our sourcing policy really sets us apart, as our aim is to make beneficial use of arisings that would otherwise likely not be used in an environmentally efficient manner. We want each piece of timber to be used to its best potential, and we do it! These sheds are made mainly from Larch, which lasts well outdoors. As we hand-craft and design these stores on site, if you’d like us to make you a Log Shed that will fit your space, we are able to make these in custom dimensions – just get in touch to discuss! If the stock status for this item is out of stock, this means that we have none pre-made at our yard. Ring our office to enquire when we can have one made for you. PLEASE NOTE: if you need this item delivering within the M60 Ring Road, and are not purchasing firewood in the same order, there is an additional charge of £36 which covers the cost of two delivery people to unload the shed from our van. If you ARE ordering firewood, the extra charge for 2 person delivery is just £12. Please see the details of delivery prices and arrangements. We can help you place the shed where it shall rest, however only within a reasonable distance (~30m from where we pull up/your drive). This item is extremely heavy and should not be carried long distances by hand. If you live outside of the Greater Manchester area, this item is COLLECTION ONLY. PLEASE NOTE: Log Sheds do not come stocked with Firewood. You can order this at the same time, however we will not stack the shed with the wood unless you purchase our stacking service at the same time (info on firewood pages).